Time Travel, strong female lead, 1893 Chicago World’s Fair, multiple time lines – what’s not to like. 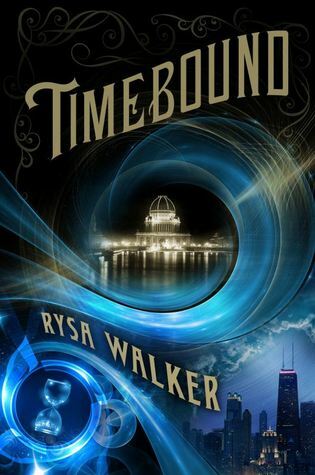 ‘Timebound’ is the first in Rysa Walker’s Chronos Series. At this point we know there will be at least three books in the series. The second book is scheduled to drop on October 21, 2014. I’m ready for it now. This is light and fun young adult fiction adults can enjoy. Walker would have delved much deeper into the science of time travel etc. had it been for an adult audience but ‘Timeboound’ is still solid. In some respects it has a flavor of Connie Willis’s take on time travel, but that detracted nothing for me. Walker also travels to The White City of the 1893 Chicago Worlds Fair. This is an intriguing time frame for the amount of inventions, scientific discovery, rampant crime, the onslaught of a huge population influx in Chicago for a short period of time, and the notorious serial killer H. H. Holmes. Walker takes us into this world without overwhelming amounts of historical information or exploiting the dark gritty level of crime to the level of ‘Devil in the White City.’ I enjoyed this book quite a bit. Prudence Kate Pierce-Keller is a sixteen year old girl who goes to the private school her father works at. She splits her time between her mom and dad’s house. The book opens with her grandmother, Katherine, coming into town and unexpectedly wanting to meet with Kate and her mother, Barbara. Barbara is reluctant, she has a terrible relationship with her mother. She only agrees to meet with her because of Katherine’s diagnosis of cancer. During the awkward lunch Katherine states she is leaving the house and everything to Kate. Completely unconditionally she wants Kate and her mother, or Kate and her father, to stay with her so she can get to know her grandchild. Since Kate is curious and it will be a cold day in hell before Barbara lives with Katherine, Kate and her father move in. This is where things get interesting. Her grandmother is a trapped time traveler from the future. Who knew? She has a medallion that glows for those with the ability of time travel. Kate sees blue light and that capability is about to change her life. Kate is a genetic anomaly, but the integrity of the time line depends on her. In the future, where Katherine met her husband Saul Rand, children are scientifically altered to increase their abilities and make them suited to specific professions. Katherine and Saul are historians who, who work for Chronos, and travel through time. It is very strict about rules. They protect and ensure the time line is unaltered. Saul has different ideas, however. He builds the Cyrist Religion while he is on assignment to purposefully change history. Aided by his knowledge of the future he amasses power and uses it and the church to control history. On the day Katherine got stranded in 1969 along with the other historians Saul set off a bomb that made it impossible for them to return to their time. Saul, however, has not been lazy. He figured out that while he can not time travel descendants of time travelers can. He used the Cyrist religion to adapt and alter the timeline. Kate is the only weapon Katherine has to counteract the damage he is creating. The story brings us to the center of the 1893 Chicago Worlds Fair. Kate is on a mission to save her family and history. This was a delightfully fun book. It’s just complicated enough, and just accurate enough that I could suspend disbelief and enjoy Walker’s first installment of the Chronos Series. I said that I believe both young adults and adults can enjoy this. Does it fall into YA traps? The romance could be considered a love triangle, but, maybe not. Can you really have a love triangle when the two male pieces of this puzzle only exist in different time lines? It’s a bit more complicated than a simple yes or no. You don’t have two petulant boys pushing a girl to choose to love them and only them. So, I would say no, and Walker succeeded with the minor romantic element.